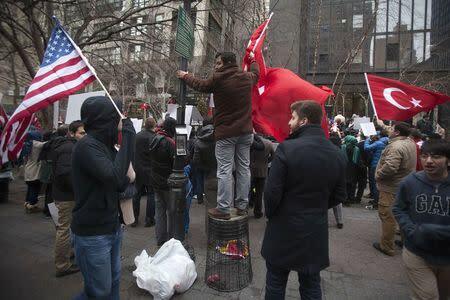 ISTANBUL (Reuters) - Turkish President Recep Tayyip Erdogan said on Saturday he is closely following an inquiry into a U.S.-based Islamic preacher and media outlets close to him and dismissed criticism that the case is politically motivated. Erdogan spoke a day after an Istanbul court ordered the arrest of Fethullah Gulen, whom Erdogan has accused of leading a terrorist plot to seize power and whose supporters the president has purged from the judiciary and police. "I am closely following the legal process," Erdogan said in a speech broadcast live by NTV channel. "Everything is working according to the law. No one is being lynched." Once close allies, the two men's relationship ruptured in December 2013 when a corruption investigation by police seen as close to the cleric's Hizmet (Service) movement implicated Erdogan and some of his family members and cabinet ministers. The president has described the corruption case as a coup plot. The graft probe has since been formally dropped. 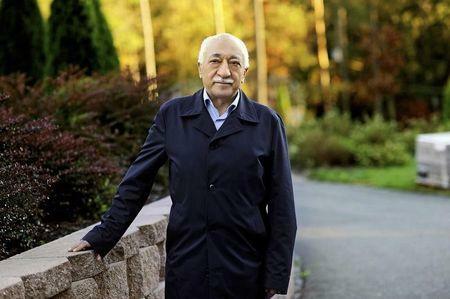 The Alliance for Shared Values, a group representing Hizmet-affiliated organizations in the United States, said in a statement the arrest warrant "is nothing more than an attempt to shift public attention away from issues such as corruption." Authorities raided media organizations close to the Hizmet movement on Dec. 14 and detained executives and other employees, prompting sharp criticism from the European Union. "So what if those detained are journalists. Don't journalists commit crimes?" Erdogan said. "Journalism is being used as a disguise." The head of Samanyolu Television, which is close to Gulen, and three other people were remanded to custody on Friday. Eight others including Ekrem Dumanli, editor-in-chief of the Zaman newspaper close to Gulen, were released pending trial. "When the president talks about the case publicly, it's an intervention in the legal process, an effort to guide the judiciary," said Dumanli, accused of belonging to an armed gang. "It's also a message to the rest of the Turkish media to re-think the way they cover him," he told Reuters.